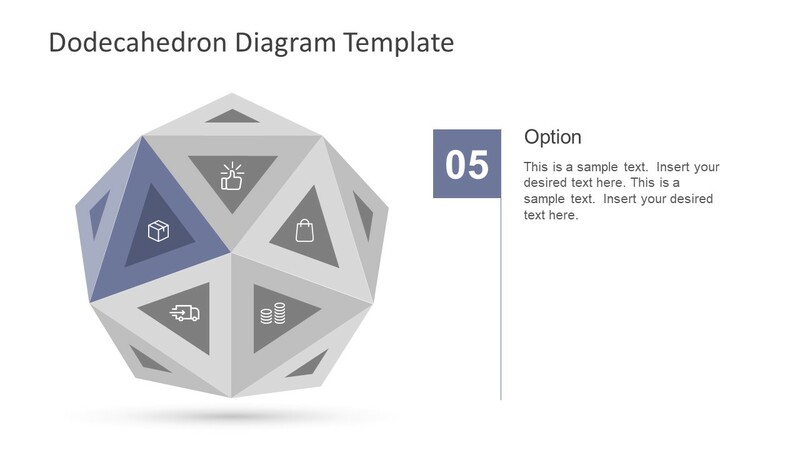 The Free Dodecahedron Diagram Template is a 5-segment pentagon shape for business presentations. 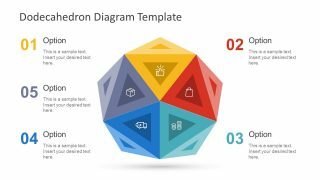 The flat design vector template is a 3D style circular diagram flow of infographics to display classification of various topics. This PowerPoint is ideal for delivering lectures, webinars and business processes effectively. The use of colorful triangular diagrams making a dodecahedron provides an interactive view to the viewers. Hence, assists in getting maximum engagement from the audience. For example, make a 5 stages approach of problem solving or sales process etc. 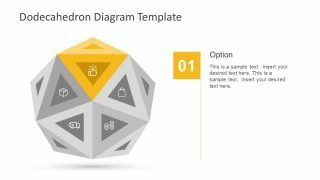 Also, create an educational and training presentation with shapes and diagram that can have a longer impact on students. 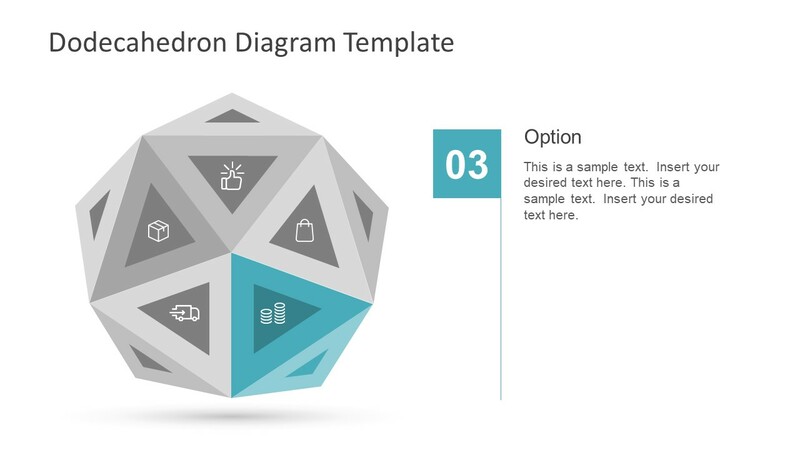 The users can present an effective data visualization of modern infographics and make complex data easily accessible. 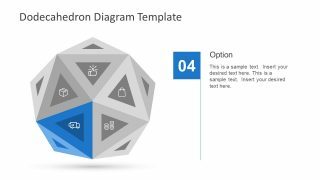 The Free Dodecahedron Diagram Template is a creative 3D PowerPoint of triangles join to make an awesome Pentagon. 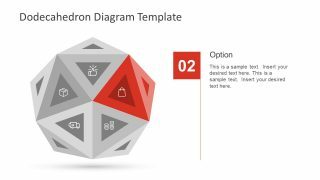 This dodecahedron shape is a collection of one inside another triangle with different shades and colors providing a 3D effect. 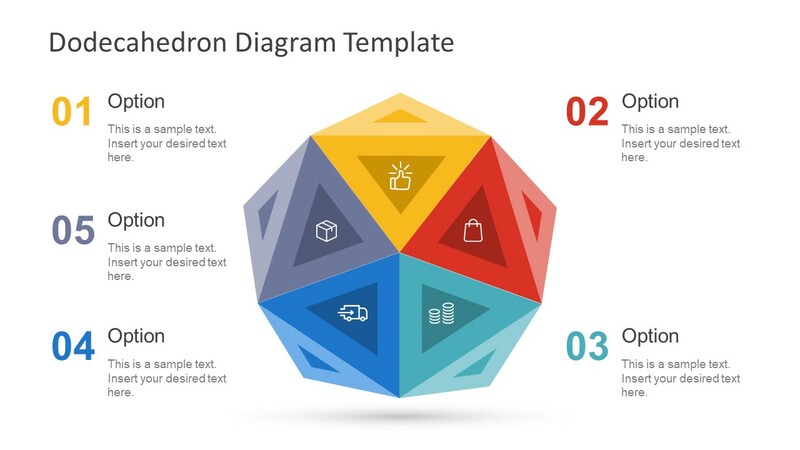 There are infographics which represent each step of the diagram along with numbers. 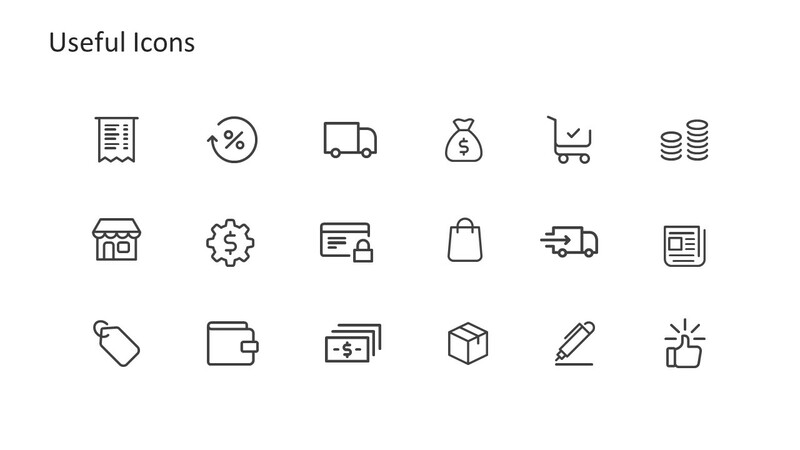 These include, thumbs up, bag, coin bars, shipping truck and box. Further, the text placeholders have numbers and title bars of respective segment colors. There are five separate slides to explain the segments of dodecahedron individually with the layout of detail placeholders. Moreover, the last slide contains useful infographics which aid in making more accurate graphical visual of the concept. 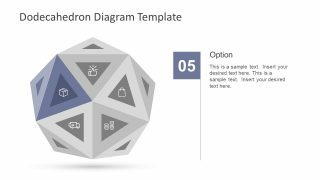 This amazing and free PowerPoint template of dodecahedron diagram is completely customizable PowerPoint. The reworkable presentation enables users to create numerous presentation for diverse topic by editing the designs. For instance, change the colors, increase or decreases the size without affecting the resolution quality. Similarly, add or delete the infographics and copy more from the slide of useful icons. 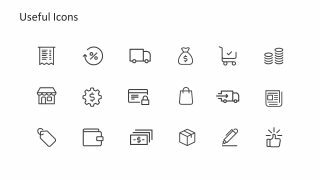 Alter the color of these icons in shape fill option of drawing format. Additionally, insert the objects like spreadsheets or images to support the content of PowerPoint from the insert menu bar.